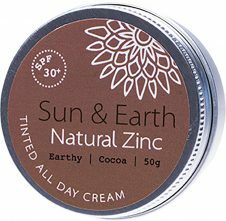 Sun & Earth Natural Zinc is a competitively priced tinted all-day cream that nourishes, tints and protects the skin. 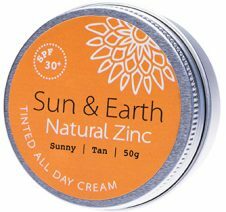 This zinc-based cream gives the skin a warm and healthy glow, while also providing an added SPF 30 physical barrier. 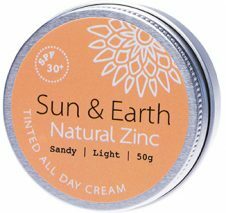 Handmade on solar power in Byron Bay from certified organic and local ingredients, Sun & Earth is biodegradable and smells like chocolate! There’s no mineral or lanolin oil! 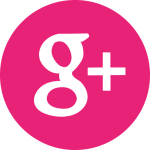 All ingredients are plant-based, natural, edible and reef safe, including the waterproofing beeswax. 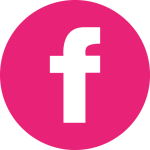 The packaging is recyclable, BPA and housed in plastic-free aluminium tins.